Recently I was lucky to run my new game, When the Dark is Gone, with four of the very finest Role-Players I know. We got through character creation fairly smoothly although as the Therapist I ensured it took no longer than an hour. I decided that the purely reflective nature of the Therapist doesn’t extend to the pre-game prepping and so took an active role in suggesting ideas and twists for the problems and relationships of the party. We established some clear out of character ground rules. Firstly a list of subjects to be avoided (one of the players had a phobia we didn’t want to trigger). Secondly that if anyone felt the game was too intense they could get up and leave the room at any time – but by stating “I need to take a break” it meant that they were going out of character and did not want anyone to follow them IC. With these house rules in mind the session began. Very soon I encountered the first major challenge of the Therapist role. In traditional games the GM monitors pacing and when awkward silences happen it is their job to fill the gap with noise. In WTDIG the opposite is true. The Therapist’s role is to say the minimum necessary to help the players draw out the story. Sometimes this means allowing awkward silences to continue. When I hit the first awkward silence I made a decision – I would allow the silence to continue for 10 beats longer than I was comfortable with. This is when the magic happened. Firstly awkward silences are quite normal in real therapy sessions. This lent a sense of realism which helped the immersion aspect. Secondly by allowing an awkward silence to continue, eventually one of the players couldn’t take it any more and started talking. By this point the pressure had been increased nicely so that whatever they blurted out was usually more interesting and led to better stories and conversations. Still it was a completely new way of GMing and very difficult. It required me to relearn the norms of GMing for this particular game. In fact I am going to create a new term to describe this style – it is not GMIng it is GFing – Game Facilitator. The other big difference I noticed was in attempting to end the game. Unlike most games with WTDIG there is no planned end-of-level boss, no deliberate climatic scene you are moving towards. The rhythm of WTDIG is totally different and it is likely you will find no obvious end point. Instead of trying to force a conclusion I simply used time. I had a player needing to leave at midnight and so I wrapped up at 11.50pm. In Character I announced that the Therapy session was nearly over and could we just take five minutes to go round the room and have everyone tell the group one thing which they learned today which was helpful. This last question was to give everyone a small sense of closure and was, I think, vital. The players enjoyed the short play test and the session was just as emotional and as intense as I hoped. I felt very invested in their personal stories as the Therapist which was unexpected but awesome. I got some great feedback which has mostly gone into WTDIG version 2 (already published here) and now have many other play tests being planned to further develop the game. There was one aspect of the session which was completely unexpected for me – this is easily a prep-less campaign setting. All the players felt they could have done more sessions and I could see how the sessions would build up on each other to create more tension and more pressure. Next time I test this game I’ll be doing it as a 6 session campaign…and if I can run an emotional, immersive yet prep-less campaign I’ll be a very happy Admiral. Top tip – mood music during character creation was great (Depeche Mode and Portishead) but I made a point of turning it off when we timed in. This made the contrast with the awkward silences more apparent and was much better for it! A long time ago (for verily I am a long way behind on my podcasts), Happy Jack’s were discussing the idea of creating pregenerated characters for one-offs but providing a list of disadvantages to choose from for each character. You get a pre-genned character but you can give it a bit of customisation. This got me thinking – why even stop there? You can give each character options for powers, skills, whatever. You could even give them options for backgrounds. Choose between a rival who is trying to kill you, a secret you can never speak of, or a long-lost sibling believed dead. The GM could then hand you an index card with more detail about your chosen option. It would mean the GM couldn’t rely on any individual background detail coming up, but it gives you a bit more ownership over your character. And the unused backgrounds could easily be saved for the next one-off, so you aren’t wasting too much effort. One-offs can very easily be just railroaded experiences, you’re handed a character and away you go. I’ve got nothing against that – but this seems to be a really simple way to replicate some of the fun of character gen without sucking up so much time that you no longer have time to play the game. It worked pretty well, and I’d definitely do it again. It hardly added any time to my prep, and equally it added almost no time to the game compared to just handing out fixed characters. Ok, apologies in advance to management experts, because I am about to abuse a well-loved management metaphor until it is hardly recognisable anymore. Johari’s window is a neat metaphor for learning and feedback. Picture a window divided into four quadrants. The top-left quadrant is things that I know about me, that you also know – public knowledge about me. The bottom left is stuff I know about myself that you don’t know – my secrets, things I could reveal to you in future. The top right quadrant covers information about me that you know but that I am unaware of – this is important for management theory because it’s the space in which feedback can happen. The bottom right isn’t seen as especially important for management theory and it isn’t important for this post either. It’s the domain of things about me that nobody knows. Maybe there some great insight that can be gleaned there, but if there is, I (rather appropriately) don’t know what it is. So, what does all this have to do with gaming? The answer is that you can use it for character generation. When you create your character, draw a window and write stuff in each quandrant. The bottom-left and top-right corners are for unresolved questions about your character. Who was that masked man? Who killed your father? What is the meaning of your birthmark? Why can’t you remember anything from the night of the 21st, and what happened on that night? Are you going to save humanity, or destroy it? But which quadrant you put each question in tells you whether this is a Dark Secret type of question – one you’re handing to the GM to answer, which might have an answer that you don’t like (top right quadrant), or one you’re going to answer yourself, at a dramatically appropriate time (bottom left quadrant). 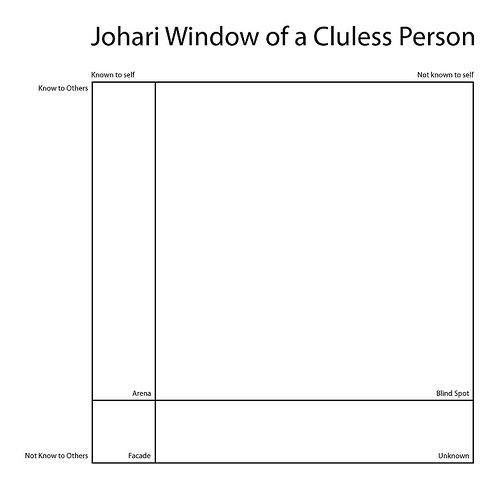 I suggest that by using Johari’s window, we can signal to the GM what questions are for her to answer, and which questions we want to keep for ourselves. Maybe you could even put some questions in the bottom right – these would be open to anyone to try and answer. The top-left corner of the window has a use, too. Put things in there that are known at the start of the game. (Known to you as players, that is – maybe not to your characters.) By putting stuff in there you’re saying to the GM “this stuff is off limits”. If I say that my character is the son of a noble jedi knight, and put that in the top left corner, then the GM should not reveal partway in that the knight in question is actually Darth Vader. That would have been a cool plotline, but by putting my heritage in the top left I’m telling the GM to stay away from it. Break the top-left window pane at your peril. The Trouble with Rose is a GMless, prepless, indie roleplaying game by Todd Zircher. It is in the style of a parlour game and falls in a similar category as Fiasco and Durance as games which divide the control of the narratives between all the players. I first found it via the Story Games Forum and found the idea and Shakesperian flavour very hard to resist. As I said, it is a similar style game to Fiasco but without the explicit car crash atmosphere, and so is better suited to my tastes. The premise is short and sweet. There is a person called Rose, they are in trouble. You are playing their friends and family and your job is to build up a story about Rose; why s/he/it is in trouble and what happens next. The simplicity of the scenario means it is easily adaptable to different genres and styles (there are a large number of playsets supporting the basic system). Rose could be a Fairy Princess, an AI deep in the Net, a schoolgirl, a pirate ship or as Todd suggests, Plutonium Rose, a rock star on the run from his groupies and the Mob. The system is fairly simple, once a scenario has been agreed the players choose a character each, writing down six character attributes, 2 of which are in some way negative. Some of our attributes were “own’s most of MadeUpShire” and the servant girl’s “total belief in the class system” but you might want to go for something simpler like “crack shot” or “very agile”. You then randomly choose 5 dominoes. Each domino has 2 sides with 2 numbers on it (blank – 6), you take it in turns to direct a scene with your character in and choose a domino to represent the character attributes you will be displaying in the scene. Blanks are wildcards and automatic failures, a double blank is played in the last round and always means that character will be removed completely from the action e.g. death. You go round the table directing scenes 5 times. Lastly everyone draws a playing card which represents your character’s hidden agenda. The dominoes provided a good amount of story scaffolding and we made good use of a reflection period after each directed scene to tie up loose ends, discuss where the story was going and evaluate our progress. Because of this there weren’t too many awkward moments where people go dry and the flow of the narrative fails. We all felt a little pressured to bring in large amounts of other characters and NPCs into each scene. This was to ensure we were giving each other enough to do. However this meant we occasionally tied the plot in knots and strained the story. In future I would make more use of cut scenes, short flashbacks and internal monologues to flesh out characters and individual relationships, rather than making sure each person is talking in each scene. In the original game there is a means to judge each other’s role-playing prowess and award points on how well you brought your character attributes into the scene. The person with the most points got to narrate the Epilogue. We agreed at the start that we didn’t feel this added anything to the game and that there were better ways to encourage and reward the same behaviour. We ditched this aspect and I felt that was the right decision. Secondly, whilst the game was GMless I feel (in all these types of game) that someone must take mental responsibility for managing the game and making sure things happen. I made sure we had dominoes and copies of the system. I guided everyone through character generation and actively facilitated the session, providing suggesting and prompts and encouraging others to do the same. I’ll write more on managing GMless games later though – that is a whole topic on its own. You may be wondering who our Rose was…she was the Scarlet Primrose, rakish hero to the French Aristocracy having rescued many of them from the Guillotine in the years after the French Revolution. Half our characters were her family who believed her to be a ditzy dilletante, the other half were from her network of undercover contacts – much amusement and drama ensued when her two worlds collided. I really enjoyed this game, it was great fun and we created a story which was engaging and interesting. I still love the idea of entirely prepless games and GMless games and I think the Trouble with Rose is more the style of GMless game I want to play. Best of all it has inspired me to write my own version of a GMless game. So a big thank you and thumbs up to Todd Z.
Oh, I didn’t mention the best bit…it is free…go here to get your copy.